If you’ve ever wondered what happens when id-iom have a little time on their hands then look no further. We’re very pleased to announce our latest video collaboration. We’ve partnered with infamous intergalactic chef and sometime bounty hunter Bhuna Fett to produce this ‘Cooking with Bhuna Fett’ infomercial on behalf of Tesco’s and their new range of Bantha Milk. We had to do an incredible amount of wrangling to get Bhuna Fett to agree to feature in our video. The amount of brown envelopes stuffed with galactic standard credits was incredible but then again what do you expect from a part time bounty hunter. After we’d paid Bhuna off we only had a 30 mins window in order to get all the footage we needed as he had some other urgent business to take care of. There I was having a flick through today’s print copy of Time Out and what do I find at the bottom of one of the first pages you come across? This little beauty. A nice little feature on some of the pop culture based subversions that we’ve been depositing in our local shops. Surely that means fame and fortune will be knocking on our door some time soon. Oh wait, who’s that ringing my bell…. No, it was just the neighbour demanding I turn the music down. I could barely hear him shouting over the smooth sounds of Nana Mouskouri. He really needs to calm down a bit. With the modest success of a few of our supermarket subversions recently my brain seems to have jumped onto the whole fake ad/culture jamming bandwagon and now it seems I can’t go to the shop without coming up with some new form of contrived nonsense. And today’s offering is a pretty good case in point. A long time ago in a galaxy far away I was strutting the aisles of my local supermarket trying to locate something they undoubtedly didn’t have when my eye chances upon the full fat milk with the blue lid. And that was all I needed to connect blue and milk and come up with the blue milk from Star Wars called bantha milk. We even see Luke Skywalker pour himself a glass in Star Wars whilst he’s living with his aunt and uncle at their moisture farm in Tatooine. That was all I needed in the way of a plan so went home and set to work. A couple of parsecs later and I had my label good to go – complete with interview with their sand person dairy farmer on Tatooine. 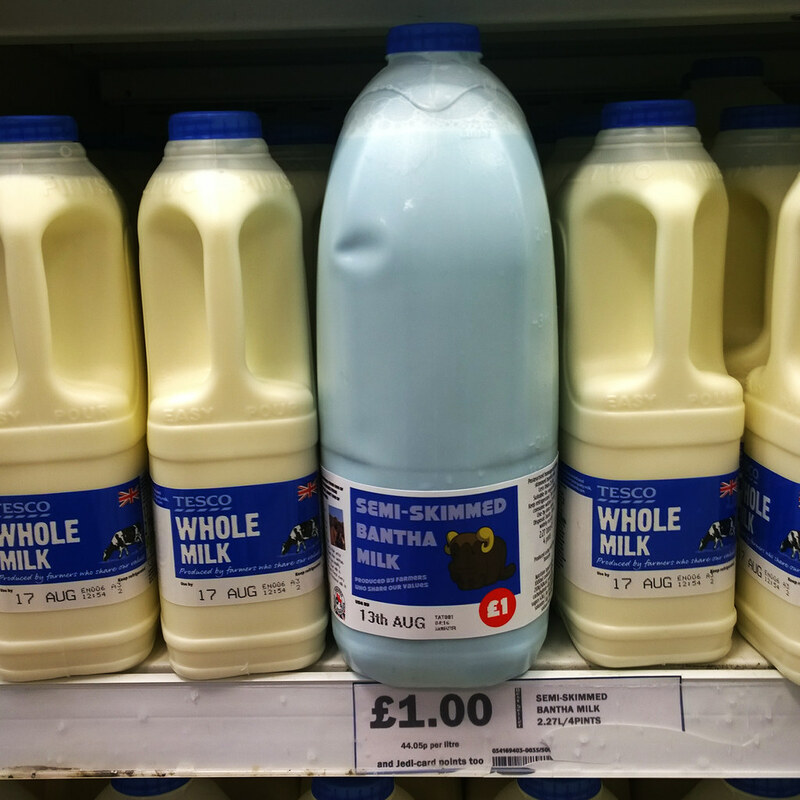 All that was then required was a bottle of milk, some blue food dye and a fake price label and I was good to go.